Mortgage rates for March fell dramatically in a turbulent market. Four important updates on mortgage rates for March 2018. 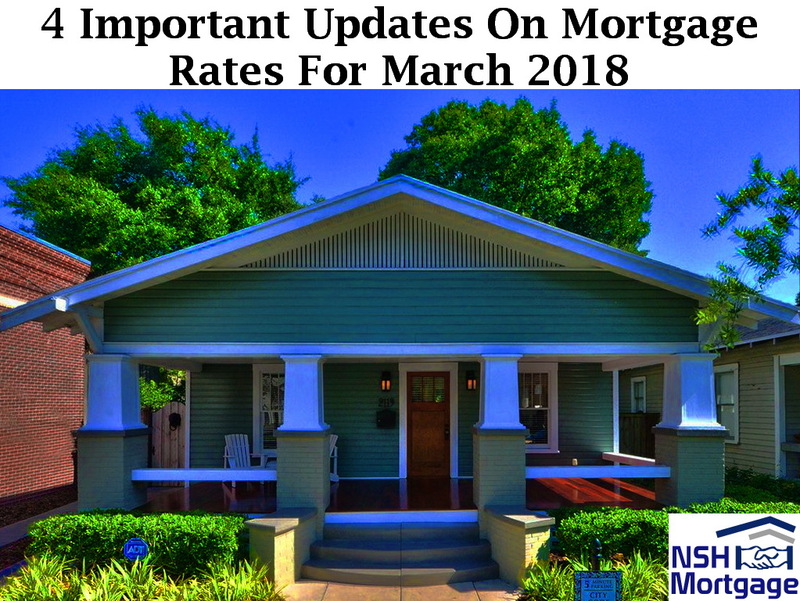 NSH Mortgage has the knowledge and tools to help you understand how to stay on top of your mortgage rates in March 2018. This morning, we got several moderate to important reports to digest, and their results present a mixed bag where mortgage rates are concerned. In addition, market participants are anxiously waiting Fed Chair Jerome Powell’s testimony before Congress today. Yet he has previously expressed the need to take inflation preventing action, higher rates and that has investors concerned. Weekly unemployment claims, moderate importance, came in lower than expected, with 210,000 instead of the anticipated 226,000. That is bad for mortgage rates, because it indicates that the labor economy was stronger than analysts thought, and that can put upward pressure on wages, inflation. Next, we have a trio: personal income which are of major importance, consumer spending which are of major importance, the core inflation rate which are of major importance. Personal income was also unfavorable for mortgage rates, increasing by .4% when experts predicted .3%. However, consumers are not spending their gains, consumer spending increased .2% instead of the expected .3%. That is good for rates, because less spending tens to keep prices lower. The core inflation came in as expected, neutral for mortgage rates, at .3%. ISM manufacturing index, moderate importance, which measures economic activity at the manufacturing level came in higher than expected at 60.8, indicating that US manufacturing has expanded faster than any time since 2004. That signifies economic heat and is bad for mortgage rates. Today’s early data, on the whole, are favorable for mortgage rates. Major stock indexes are down across the board this morning, good for rates, because rising stocks typically take interest rates with them, making it more expensive to borrow. Gold prices fell for the third straight day, this time by $11 an ounce to $1,309. That is bad for mortgage rates. In general, it is better for rates when gold rises, and worse when gold falls. Gold tends to rise when investors worry about the economy. In addition, these worried investors tend to push rates lower. Oil fell for the second straight day by $3 to $60 a barrel, very good for mortgage rates, because higher energy prices play a large role in creating inflation. The yield on ten year Treasuries decreased by 4 basis points, 4/100ths of 1%, to 2.84%. This is very good for mortgage rates because they tend to follow Treasuries. CNNMoney’s Fear & Greed Index dropped 5 points to a reading of 12, out of a possible 100. That is considered the extreme fear range. Additionally, when moving into a more fearful state is usually good for rates. Fearful investors generally push bond prices up, and interest rates down, as they leave the stock market and move into bonds, while greedy investors do the opposite. However, that will not be the case if the reason for the fear is potential inflation. Monday: New home sales for January, minor importance. Tuesday: Durable goods orders for January, moderate importance, Case Shiller home prices for December, moderate importance, and Consumer Confidence for February, major importance. Wednesday: Pending home sales for January, moderate importance. Thursday: Weekly unemployment claims, moderate importance, personal income, major importance, consumer spending, major importance, the core inflation rate, major importance, ISM manufacturing index, moderate importance. Friday: Consumer sentiment for February, major importance.